Special guests Bill Arnold and Dave Arch Guaranteed to add fun and value to The Bob Pike Group’s 20th Annual Conference September 11-13, 2013. Classic and clean is still funny, and Bill Arnold aims to prove it at the Night of Creativity at The Bob Pike Group’s annual Creative Training Techniques Conference September 11-13, 2013. Combining classic magic tricks with comedy, Arnold embodies the spirit of old school comedians. His humor is free from controversy and gives audiences a chance to simply sit back, laugh and re-focus as they marvel at his magic tricks and appreciate the value of classic jokes and gimmicks. As the Seattle Post Intelligencer said, "Bill Arnold is an amazing magician. His bad tricks are hilarious." Bill is one-third of the creative team behind the nationally successful show Triple Espresso and this year he will be highly caffeinating the conference. Keynoting this year is Dave Arch, a noted authority on training, coaching and management. Dave will draw upon his 25 years in the training industry as he kicks off the 20th annual conference with his keynote entitled "Who Me? Coach?" where he will be detailing the nationally recognized mentoring model he uses at Tenaska, Nebraska's largest privately held company. He too, is an accomplished magician who has authored a dozen books for trainers including Tricks for Trainers. What advantages are there in attending The Bob Pike Group conference? New techniques and learning theories that engage and involve seminar attendees are modeled to experience exactly how effective they are, expert trainers available throughout the three days to ask questions and bounce around ideas, and the intimate setting allows an attendee to get to know other participants so they can build up their own trainer network and glean great action ideas from them. There is still time to register for this event that offers proven and cutting edge training techniques and a chance to network with some of the brightest minds and most dedicated trainers in the industry. 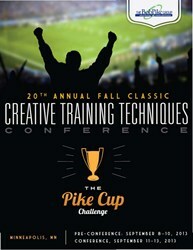 More information on The Bob Pike Group’s 20th Annual Training Techniques Conference can be found at http://www.bobpikegroup.com/fall. The Bob Pike Group has provided train the trainer workshops and consulting services to individuals and corporations for more than 30 years.